How has the start of the week been for you? Here’s a reminder that welfare pack giveaways for PAW starts on this coming Thursday, 22nd October, till Friday, 23rd October! We’ll be at the AS6 walkway benches 17-19. Do remember to bring your membership card along in order to receive the welfare packs! For nonmembers, you can sign up on the spot as well, and receive the packs! For the entire week, wear your Psychology shirt on any day (or days) to show your appreciation and support for Psychology! We recommend you to wear it on Thursday. Let’s all fill FASS with our amazing shirts! Stop by our benches to write your dedications to our amazing Psychology lecturers! We’ll provide the paper, and deliver it to them, so all you need to do is to express your gratitude to them, and we’ll do the rest. Collect your welfare packs at AS6 walkway, benches 17-19! Welfare pack collection will only be held on Thursday and Friday. Membership cards must be presented, or sign-up on the spot to receive a pack. If you have some time to kill before your lecture/ tutorial, just grab a few of your friends and start holding the ‘rope’ randomly at AS6 walkway. Then get your friends to start stepping over the rope repeatedly. If it happens often enough we’ll just watch this amazing conformity experiment (hopefully) come to life! Our Exco members will always be at the booth in front of the Psych notice board along AS6 (where the T-junction outside CLB is) and we will be there to help if you need us! Let’s all join in to this, and show the entire school, how amazing Psychology is in predicting and explaining everyday behaviour! Be a Flag Day Ambassador for NKF! 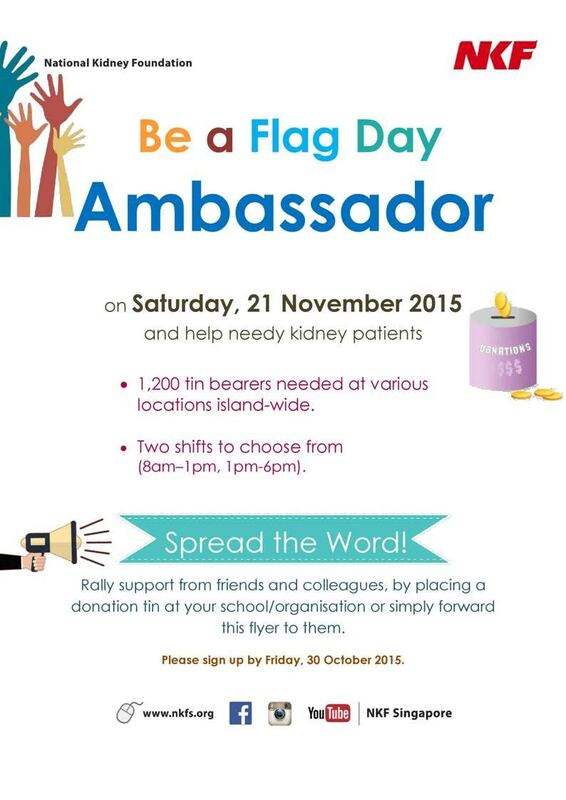 The National Kidney Foundation (NKF) is looking for volunteers to aid them in their upcoming Flag Day on Saturday, 21 November. For more details, please go to http://www.nkfs.org/event/flagday/ and if you’re interested, do sign up by Friday, 30 October. The poster below is also for your reference, to learn more about the event! For those who haven’t liked our Facebook page (https://www.facebook.com/NUSPsychologySociety?ref=aymt_homepage_panel), please do so as we’ll have more updates and information on the Facebook page as well!